Specialist broker for higher risk works such as Demolition Insurance, whether you carry out Demolition or Soft Strip. At Construction Insure we are very rarely beaten on knowledge and service and offer highly competitive premiums across the range of demolition insurances. Full understanding of the needs of developers and contractors alike. Whatever your demolition insurance requirements, please get in touch today for a free no obligation quotation. Demolition is one of the most high-risk and time-consuming aspects of a build. As you may be aware, not many insurers are willing to provide cover when you need to demolish a building or structure. The companies that do provide cover, stipulate strict conditions and restrictions. It takes an experienced broker to find you the right Demolition Insurance for your requirements. Which is where Construction Insure can help you. Why do you need Demolition Cover? You may be using an external contractor to demolish a Victorian chimney with expert precision. You may be demolishing a tower block with a controlled explosion. Or you may be reducing a single house to a pile of bricks. Whatever you’re demolishing, each project requires its own level of planning and preparation. And its own specific type of cover. How can we help you get the right Demolition Cover? Construction Insure are a specialist construction broker. 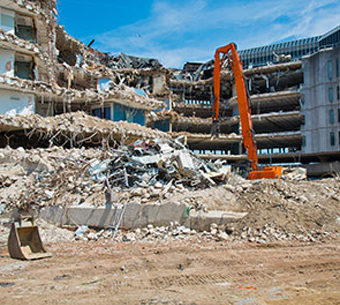 Whether you’re contracting outside services or using your own expertise, we have the right contacts to help you get your demolition project - and your construction project - the right cover. We’ll get you cover to insure you for general demolition, soft strip, ball & chain and, of course, explosives. The size of your project isn’t an issue either. We can get you cover for up to all heights and depths, so, whether you’re bringing down a single wall or an entire street of houses, we can help you. HOW CAN WE HELP YOU GET THE RIGHT DEMOLITION INSURANCE COVER? What about complications during your demolition? You should also think about insuring your project for the unexpected. Such as discovering that the building you’re about to demolish contains asbestos. Not only would you need to be covered for asbestos removal - which we can combine with your Demolition Insurance - but you may also need to be insured for any penalties incurred by a delay to the job while the asbestos is safely removed. We can also provide you with Asbestos Insurance for site surveys. Will you need Liability Insurance? You may also need other provisions, depending on the scale of your project and whether you’re carrying our your own building demolition or using outside services. We can insure individual aspects of your project, with Professional Indemnity, Professional Liability or Public Liability Insurance. Public liability insurance starts at £2 million and goes up to £10 million. If your demolition is taking place in a residential area or close to the public, it’s definitely something you’ll need to consider. Is Contractors All Risk cover the right answer? The better choice for you could be our Contractors All Risk Insurance. This will cover you for all aspects of your entire project, from planning to completion and beyond. It will cover you for the contract length and the cost of the contract. It covers your employees, whether they’re your own staff, sub-contractors or manual staff. Your own plant and machinery equipment and hired plant and machinery equipment will also be covered. And the policy includes Public Liability up to £5 million and Employees Liability up to £10 million, as well as Professional Indemnity Insurance. Insurance, like construction and demolition, needs experts to ensure your project has the right insurance cover. That’s what Construction Insure are here for, to help you get exactly the right insurance for your project. We have years of experience in the industry as well as excellent knowledge of the current market. For a no obligation quotation or chat, please call us on 020 3958 6868 and we can discuss your requirements. Once we have more information and have found out more about your project and your budget, we can get you the tailor-made insurance cover that’s right for you.